This weekend in Smithfield Virginia is the annual car show. Yes, it's the Smithfield that is home to Smithfield Ham. No, we didn't spot any hams, just cars. If you're really into ham, you can use Google to visit the Ham Cam online and see the world's oldest ham! Some of these cars are older than me even, so if I'm not chock full of information, well, you can always look it up or just see if you spot something you've never seen before. Most of today's show was all about America, with tons of Chevy, Ford, Dodge, Chrysler, even a DeSoto and a Hudson! OK, a refurbished modernized DeSoto is probably more American! Yes, I'll take a classic yellow V8 hot rod, thanks! Why can't Ford keep putting dogs on their hood ornaments? 78. Lincoln. It's. So. Loooooooooooong! When air filters were ROUND! Epic Chrome Dagmars. You can look it up. Race prepped Mustang, here's the fuel cell and battery. Also had race seats, belts, cage, and Hoosier tires. Very few foreign cars, a French 2CV. Ford in a few more years. 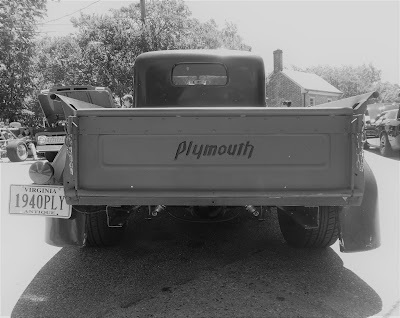 a 1940 PLYMOUTH pickup truck? I bet that house is older. "Product of Chrysler Corp USA"
Seen a Plymouth Scamp lately? I didn't think so. You probably can't buy an interior like this today. Maybe this hot rod will help you forget the Scamp! 1964 Dodge Dart. Also not seen everyday! 1936 Chevy. Really older than me! Even in Yellow, the Corvette is a winner! I'm SURE you haven't seen one of these today! Even I can change spark plugs if they're on TOP of the engine!